FREE Shipping (First Class) within the United States! 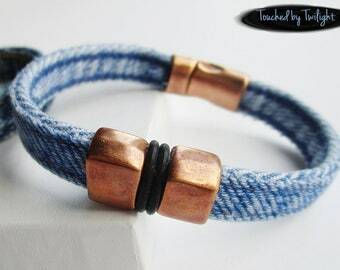 This simple and unique wrap bracelet is handcrafted from recycled/upcycled blue jeans. The magnetic closure is cast from zinc and plated with 99.9% sterling silver. The overall width of the bracelet is approximately 1/2" (7mm) and wraps twice around the wrist. It's ideal for both men and women! The denim has been treated to deter fraying, but some is still normal, to be expected, and can be carefully trimmed off. This only adds to the charm of the bracelet. 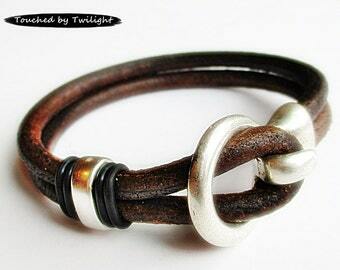 To wear: Simply wrap the bracelet around your wrist and let the magnetic closure snap together. To open the closure, just lift one side as though you were opening a hinged box . . .
SIZING: The sizes shown are the approximate inside diameter of the bracelet when closed. The closure holds the denim securely and the latch cannot be "pulled" open, so this bracelet can be worn either loosely as a bangle or as a bit more snug cuff-type bracelet. Using a tape measure, wrap it around the wrist and take the measurement. When measuring for a "snug" fit, as a general rule, you should add about 1/4" inch to your wrist size to allow the wrist to move normally with the bracelet on. How you plan to wear it will determine what size you should order. Please select your size carefully. While I will always accept a return (in the same condition as it was shipped to you), you will be responsible for the cost of returning it to me. Because I know that selecting a bracelet size without trying it on is a difficult task, as a courtesy, I will cover the cost of sending the new bracelet size to you (one time only). For more information on returns, please review my POLICIES and FAQ's. 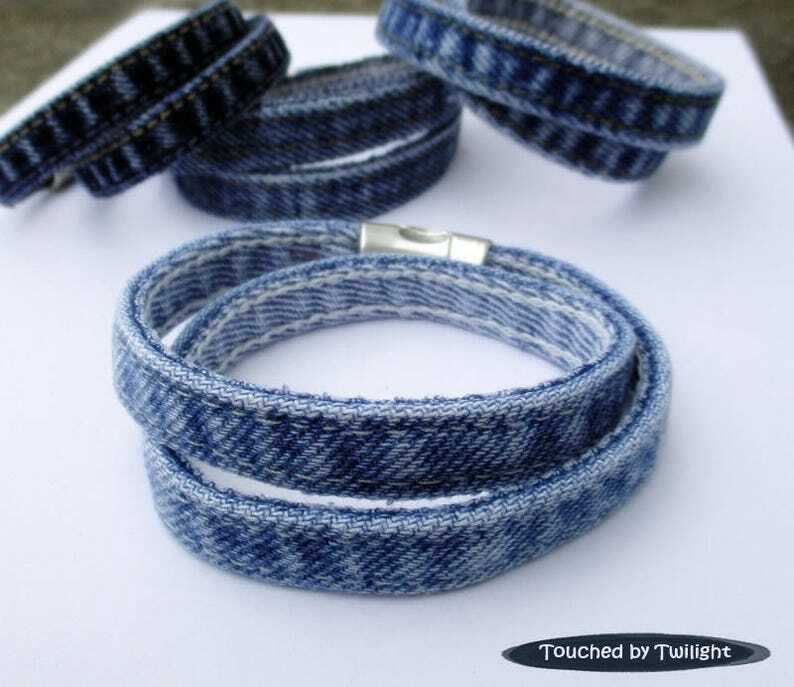 COLOR: All bracelets are similar in pattern/wear but there will be variations in color from light blue to a medium blue to a darker blue (see pictures) depending on the jeans I have available to me. The shade of blue you will receive will depend upon what I have available in the size you select. NOTE: The price shown on this listing is for ONE bracelet. My picture depicts several bracelets to give you an idea of the possible color/s you could receive. RETURNS: Please review my POLICIES as well as FAQ's for return guidelines . . .